A recent news story has wealthy men all over the world checking their bank account balances. Romanian con-woman Maria Nistor convinced five older wealthy men to give her £500,000 (about $654,900) in fake get-rich-quick scams. Not only did she scam each of these men out of a lot of money based on the promise of a killer real estate investing deal, but she got to each of them through MillionaireMatch or SugarDaddie. This and other tails of catfishing (posing as someone else on a dating site) have brought up a lot of concerns, especially for wealthy men looking for love. So how can you identify a scammer before they do any damage? Look for a few key clues. Granted, many younger women are interested in older men, especially when those men are well established financially. However, if you’re in your 50s or 60s, and someone who’s 23 or 25 starts messaging you out of the blue, you might want to be wary. If they can’t tell you where they work or what they do, you should be on high alert for a scam, especially if they ask for money for anything, and especially if they bring up finances or investment opportunities before you meet them. They claim to live near you, but they’re always out of town on business and can never meet for a drink or dinner. In most cases, this means that they don’t live anywhere near you and/or they aren’t who they say they are. If their photo seems suspicious or if you’ve noticed any or all of these other signs that they may be a scammer, save the picture and go to Google’s “Search by image” function to see if it’s stolen from a stock photo site, another person’s dating profile, or someone’s social media profile. If you notice a lot of typos and weird language in chats and/or email messages, especially misspellings of your name or their own name, then you’re almost definitely dealing with a scammer. Block them and walk away. 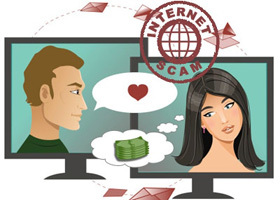 If you identify a scammer in an online dating site, don’t just ignore their messages. Report their account and block them. Make sure that they can’t get access to you or others, and the online dating world will be a better place for everyone.